Based on the Stanley No. 60½, this versatile plane is useful for every sort of woodworking job and a pleasure to use. The movable shoe in front of the blade allows you to easily and precisely adjust the mouth opening: fine mouth for finishing work and thin shavings, or ample opening for rank cuts. Ductile Iron body is surface ground flat and square to a tolerance of .001" or better. Large, comfortable Bronze cap is tensioned with a 1-1/2" Brass spinwheel. 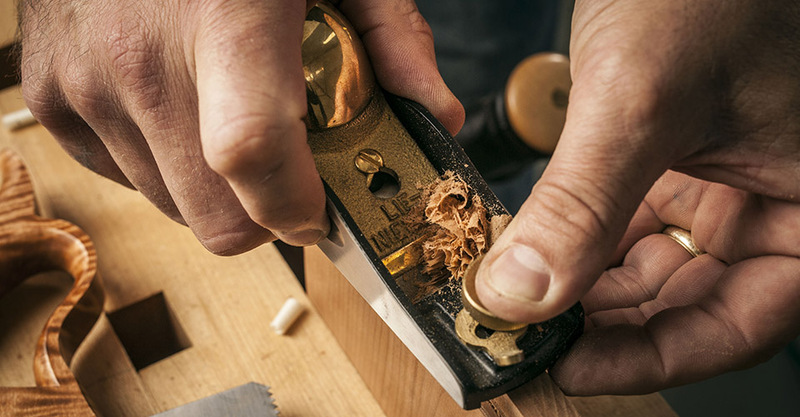 Like our other block planes, the blade is adjusted with a captive nut for precise control with minimal backlash. The blade is bedded at 12º for fine cuts and end grain work. Weight 1.5 lbs. Blade is 1-3/8" wide x 1/8" thick. 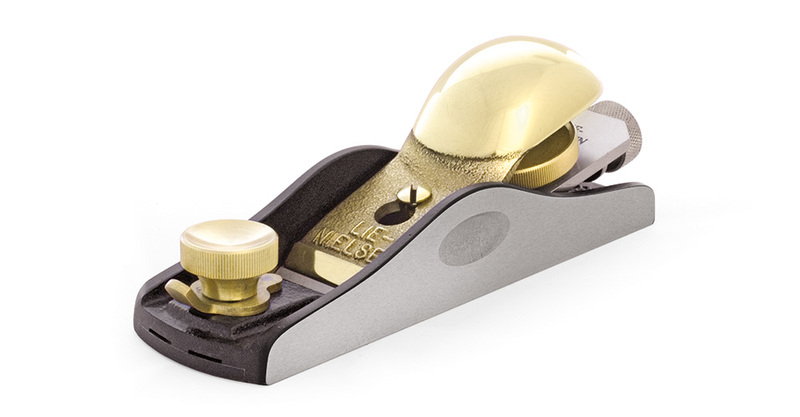 The Adjustable Mouth Block Plane is available with the optional Rod Maker’s Groove for an additional $35. This groove is ground 1" wide and .003" deep into the sole of the plane, making it the perfect companion tool to a rod maker’s form. Also available for the Small Scraping Plane. The No. 60-1/2 Adjustable Mouth Block Plane is a general purpose tool, useful for fine trimming and finishing work, as well as rapid stock removal. The body has an adjustable shoe to allow quick and easy control of the mouth opening. 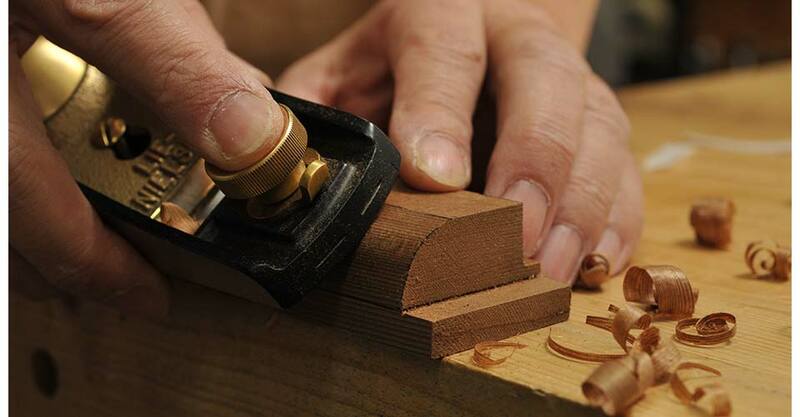 The best finishes will be obtained with the blade set to take a very small cut, and with the mouth opening no larger than necessary to pass the chip. When you want to cut more aggressively, open the mouth more and advance the blade for deeper cut. For best results on end grain, set the blade and mouth fine. In the Low Angle Plane, the blade is bedded at 12°, making the included cutting angle 37°. For more information on advanced sharpening we recommend David Charlesworth’s video Plane Sharpening, available in both DVD and streaming formats. Hold the tool in one hand with your fingers supporting the sole and your thumb on the cap iron just in front of the screw. Loosen the spinwheel and, with your thumb still holding the blade and cap, adjust the blade. Tighten the spinwheel. Do not overtighten. You should be able to adjust the blade after loosening the spinwheel about ¼ turn. Make sure the mouth is adequately open before advancing the blade to avoid damaging the edge. Hold the sole in the palm of your hand and loosen the brass locking screw. Adjust with the brass lever. Tighten the screw firmly, but do not overtighten. The body is cast from Ductile Iron, a very strong alloy that will take a lot of abuse. These castings are fully stress relieved, a process that removes inherent stresses and ensures that the tool will remain flat and true. The cap is Manganese Bronze. Other parts are Brass and Stainless Steel. The blade is A2 Tool Steel hardened to Rockwell 60-62, cryogenically treated and double tempered. Our heat treating technique ensures that the blade will take and hold a very fine edge for a long time. After heat treating, the blade is fully surface ground on the top, back, and cutting edge, giving a smooth, flat surface that will take a mirror finish very quickly. The 1/8” thickness provides solid chatter-free cutting. The body casting is ground flat and true (to .0015"). Occasional hand lapping with fine wet/dry sandpaper (320 grit or higher) on a flat surface will help remove dings and keep it true. The cap iron can be polished with any good brass polish, or allowed to patina with age and use. Occasionally, the tool should be disassembled, cleaned, and moving parts oiled. The blade should be kept lightly oiled to prevent rust, especially when the tool is not in use. We recommend Jojoba Oil, a plant based oil product that is non-toxic, odor-free and easy to use. Also, in our shop, we use a fine abrasive handblock to remove any light surface oxide from tool bodies and blades. Jojoba Oil and abrasive handblocks are available from us. Find everything you need for tool care. 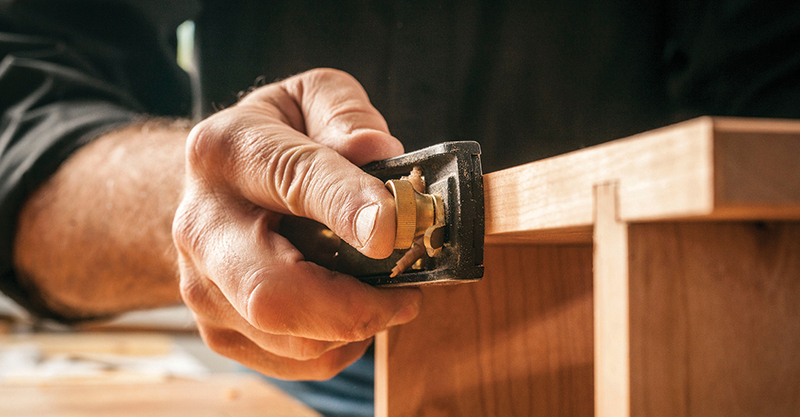 Materials and workmanship are guaranteed for the life of your tool. Call for repairs or replacement parts. We are available for advice if you ever have a problem using your tool. Bronze and brass alloys contain lead, a chemical known to the State of California to cause cancer and birth defects, or other reproductive harm. Wash hands after handling. Jojoba Oil - 2 oz.